Whilst the winter chill arriving is not usually a cause for celebration, it does herald the beginning of rosehip picking season. Rosehips are best harvested after a good frost. Collect them when they are fully matured and have reached their most vivid shade of red or bright orange, and while they are still firm to touch – not mushy and over-ripened. 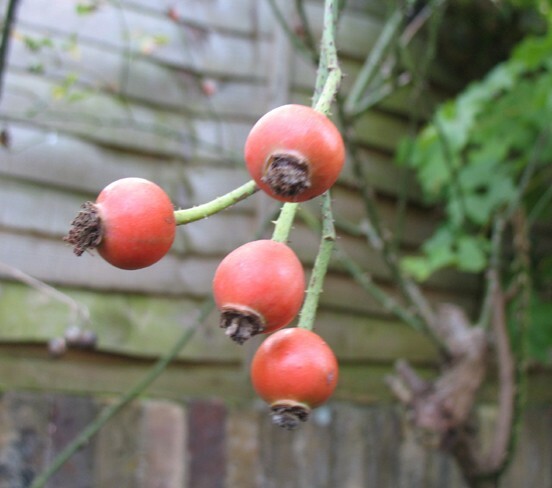 When I first made rosehip syrup a few years ago, I painstakingly pulled the seeds and spine from the rosehips one by one. The spines are small, very sharp and prone to getting under fingernails. They’re itchy and take forever to get out. Now I make my rosehip syrup with the whole rosehip, cut in half and then pass it all through a fine muslin cloth. No more sharp spines! Mince the rosehips and drop them into boiling water, stir then take the pan off the heat and leave to sit for 10 mins. Pour through muslin (really important to get the spiky bits out – I found this out the hard way!). Return the strained juice to the heat, add 2cups of cold water and bring to the boil, stir, then remove from the heat and let stand for 10 mins. Pour through muslin. Do this a couple more times. I like to add the juice of a lemon to the recipe to bring the sweetness down. It also brings up the colour of your rosehip syrup. Dried rosehips make a lovely addition to your favourite herbal tea. And they look gorgeous if you’re making a herbal tea as a personal Christmas present. Here’s how you dry your rosehips. Eatweeds recommends sieving them once dry to remove the sharp hairs.